The Only Pantone Color Named After A Movie Character Is Named After A Character From Which Movie? What Iconic Children's Toy Started Life In A Military Research Lab? Pantone Inc., a U.S.-based company best known for their Pantone Matching System color space used in the print and manufacturing industries, has always actively promoted the use of color and by various promotional tools such as announcing “Color of the Year” but until recently they had never formed a tie-in with a movie. 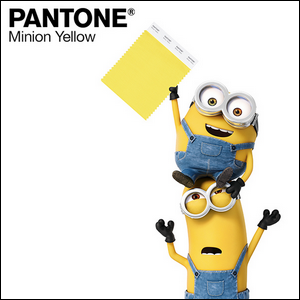 Color naming firsts and marketing tie-ins aside, we’ll have to agree with Miss Pressman; the yellow color of the Minions certainly is vibrant.